General booking is now open for the 2015 Archives for London conference.To celebrate the 800th anniversary of Magna Carta, the AfL conference will explore the challenges to and the protection of freedom and liberty in London since Magna Carta guaranteed the Capital’s ‘ancient liberty and customs’ in 1215.
with speakers including Caterina Loriggio and David Prior from the Parliamentary Archives on Parliament in the making, oral historian Clare Summerskill on recording voices of LGBTQ Londoners, and Paul Dudman with Dr Rumana Hashem of University of East London on refugee narratives in archives. The City’s 1297 Magna Carta will be on display. with speakers such as Prof Justin Fisher on Magna Carta’s relevance today, Simon Carter on St Paul’s Cathedral and civil rights, Prof Michael Macmillan on what art and heritage tells us about Black British cultural identities. 1730–1830: BBC2: (5/6) Indian Ocean with Simon Reeve. (Part 5 – Sri Lanka to Bangladesh). 2100-2200: Channel 4: (7/12). Homeland. (Series 2 Part 7 – The Clearing.). Series Recording. 1930-1955: Channel 4: Unreported World – (Episode 4. The Master Chef of Mogadishu). Series Recording. During early August 2012, at the height of the Olympic glow in the East End of London where I live and work, it seemed almost surreal to be preparing myself for a trip to the West Coast of the United States in order to attend the 76th Annual Meeting of the Society of American Archivists (SAA) to be held in San Diego. I had been very fortunate to receive a bursary from the Section for International Engagement at the Archives and Records Association in order for me to be able to attend the Conference, and several months after originally being approached to submit a panel paper, it was hard to believe that the time to fly had actually come. My background is as the Archivist responsible for the Refugee Council Archive, located on the Docklands Campus of the University of East London, (UEL). This represents the archival collection which was developed and maintained by the British Refugee Council from the early 1950s through to the late 1990s. 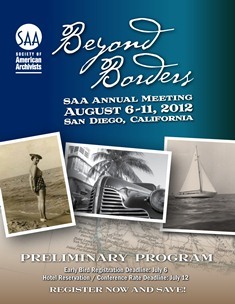 It was with this association in mind, that I was initially contacted by Anna Marie Mallett, Vietnamese American Heritage Archivist at The Vietnam Centre and Archive, Texas Tech University, to see if I would be interested in forming a panel session for the 2012 SAA conference on the subject of refugee archives. The conference theme for 2012 was centred around the idea of `Beyond Borders’ which seemed to fit nicely with the work we were all doing in relation to working with archival collections relating to refugee communities. The conference was scheduled to take place at the San Diego Hilton Bayfront Hotel with the Pre-Conference Programs taking place between August 5, 2012 – August 7, 2012 and the main Conference Datesbeing between August 6, 2012 – August 11, 2012. A full `Beyond Borders’ Conference Program is available for reference. I will admit to a little apprehension having never previously presented at an international conference, but felt equally this was a unique opportunity to gain and share professional experience within an international archival setting. Our panel proposal subsequently became session number 509, entitled, “Beyond Resettlement: Overcoming Hurdles to Document the Experiences and Contributions of Refugees.” It was now down to me to secure the funding to make the trip actually happen and after making contact with the Archives and Records Association; I elected to apply for their International Engagement bursary. I applied in hope rather than expectation and I was certainly taken by surprise when the award of the bursary was confirmed. SESSION 102 – Archiving Mujeres: Un Movimiento Toward Greater Indiscriminate and Inclusive Recordkeeping Practices Within Information Repositories. This panel provided an interesting account of some of the work that is being done in an attempt to record and preserve the diverse experiences of Latinas and to make their testimonies more visible within the archival record. 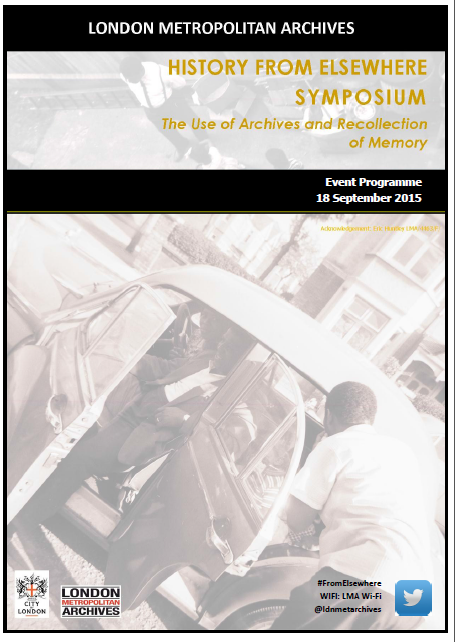 SESSION 203 – To the Community and Beyond: Engaging Users to Interact with Participatory Archives. This panel session provided a thought provoking discussion on how the combination of outreach and new social media tools could be used to reach those especially under-documented communities in order to help encourage them to tell their stories and to share their history. Each of the speakers presented their own approaches to the use of technology within an outreach context to help discover and document those testimonies that may be overlooked by more traditional archival approaches to acquisition and dissemination. Asian American Studies at UCI. For the record, my paper was entitled, “Rescuing Refugee Archives: Preserving the history of the refugee experience, a UK perspective.” In the preparation for this paper, I had attempted to explore the concept of the refugee as being a traditionally under-documented and under-represented group within the broad remit of the archival record and this was to prove a reoccurring theme throughout all of the papers within our panel. which has provided the basis for the Vietnamese Oral History Project at UCI. This project began in 2011 with aim of assembling, preserving, digitising, and disseminating the life stories of Vietnamese Americans in Southern California. Once completed, the oral histories will be preserved at the Southeast Asian Archive at UC Irvine Libraries. Indeed, the official library website for this project was launched on the 24 October, 2012 with press coverage including both The Washington Post and The Huffington Post. I found the experience of attending the 76th Annual Meeting of the Society of American Archivists to be a very informative and rewarding one. It was a wonderful opportunity to mix and network with colleagues, both from the United States and internationally, to see at first hand the successful and stimulating work that is being undertaken to help preserve the records and testimonies of many communities in many different ways. It has also reinforced the belief that there is still much work to be done in order to understand how archival institutions can best work with refugee and other communities to record and document their voices for posterity. However, there is still much left to do and It is perhaps good timing therefore, that we have just witnessed here in the UK, the launch of the Campaign for Voluntary Sector Archives which is a campaign dedicated to the preservation of our voluntary sector archives. last full day in San Diego was therefore spent trying to visit as many places of interest as I could. In the short time that I had, I was able to visit the amazing beach at Coronado; the shops and restaurants and San Diego Seaport Village; a tour of the city on a San Diego Old Town Trolley, (incorporating a tour of Balboa Park); and the Old Town San Diego State Historic Park. However, as a final footnote to this posting, it was interesting to note that whilst exploring the Maritime Museum of San Diego, I was able to explore the nineteenth-century sailing ship the Star of India. The Star of India, under her former name of Euterpe. Had spent almost 25 years has an emigrant ship transporting mainly British emigrants from London to the New Zealand and Australia. After experiencing a very engaging seminar on the issues concerning refugee archives, this just helped reinforce that the refugee experience is always around us and often appears in the places that you least expect it! [i] Marfleet, Philip. (2007). Refugees and History: Why We Must Address the Past. Refugee Survey Quarterly, Vol. 26, Issue 3, pp. 136-148. 2100-2200: Channel 4: (1/6) Living with the Amish. VIDEO Plus+: 6873. Whole Series Please. The Refugee Archives have just published two new publications on the Refugee Council Archive website. BOA Materials in the new Archive Reading Room. available online viw the RCA wesbite. This newsletter provides current news in relation to the work of the Archive, including the recent work undertaken to refurbish the reading room. Full Link: www.uel.ac.uk/rca or Download Here (PDF – 4.75 MB). Secondly, The Refugee Archives have also published their latest quarterly accessions list for the First Quarter (January – March) of 2010. This document gives an update of new materials which have been catalogued and made available within the Archive. Full Link: www.uel.ac.uk/rca or Download Here (PDF – 0.3MB). If you have any questions or feedback, please let us know. 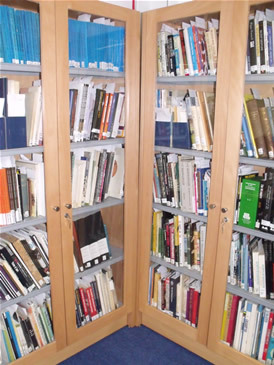 Either leave a message here on contact us on: library-archives@uel.ac.uk.